I probably had you thinking, "Rolling out of bed at 5am", by the title that I chose. No, not this time. 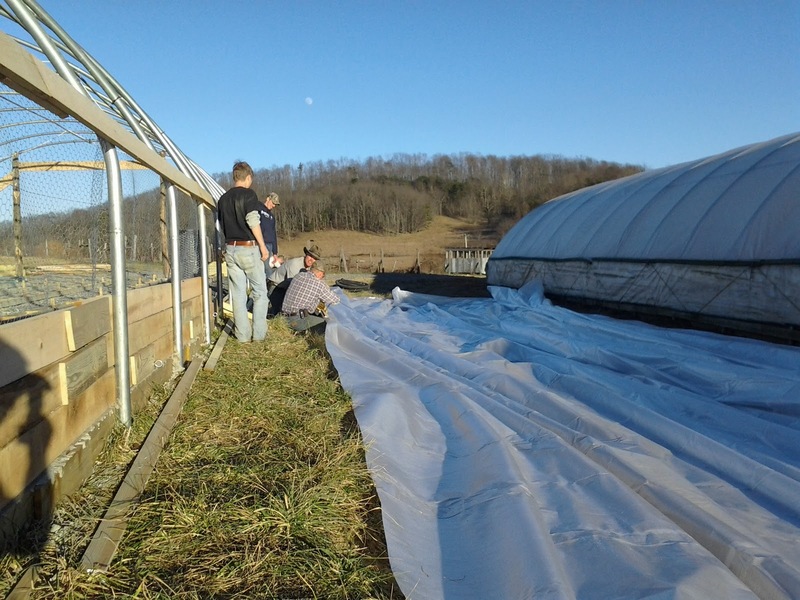 What is really up at five is a new hoop house. We have recently completed the construction of the fifth hoop house on the farm. 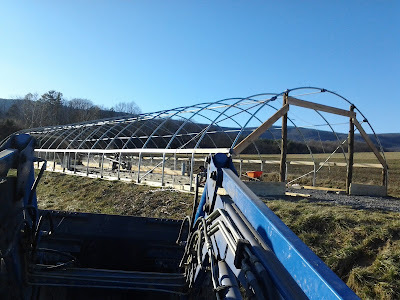 Number 5 is the same size as hoop houses 3&4 but we added some special features to accommodate the housing of pigs for the winter. 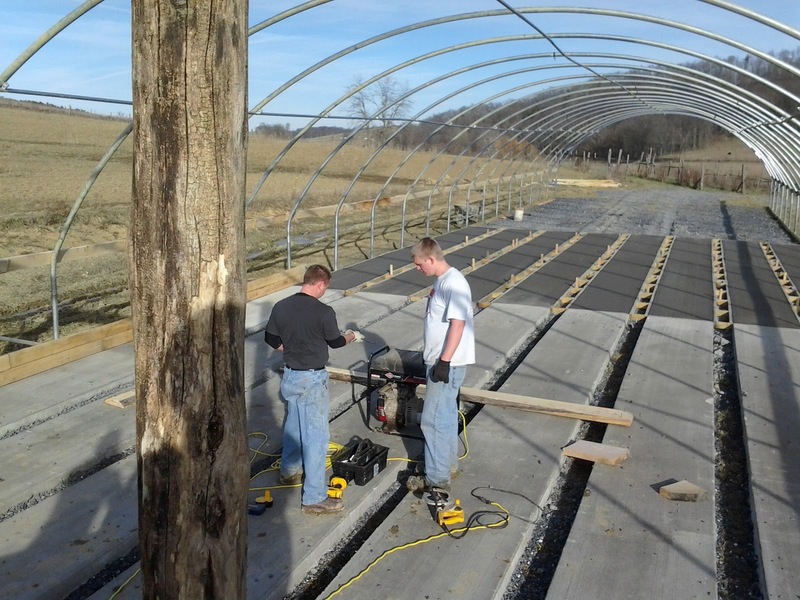 Because it's the nature of pigs to dig into the ground, Joel and Daniel came up with a design to eliminate the big holes that they can create. The design consists of having three foot wide slabs of concrete running down the length of the structure with ten inch gaps between the slabs. 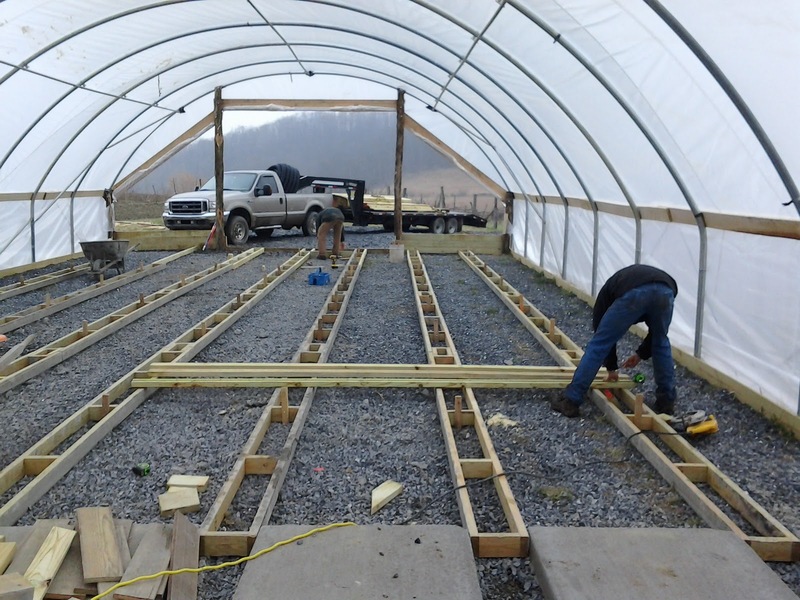 We then cover the entire floor of the hoop house with wood chips which fill in the gaps and builds up to 8"+ of deep bedding for the pigs. The cool thing about the ten inch spaces is that the pigs can't dig through them and in the spring we can scoop out the old bedding and plant vegetables in the rows, with the three foot wide slabs keeping down the weeds!!!! It's awesome! 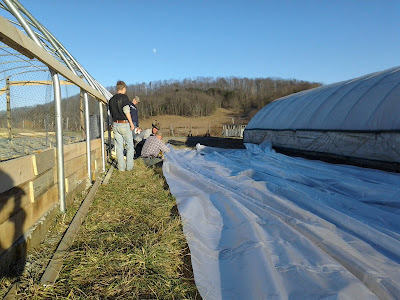 We also put a heavy wire mesh along the sides of the hoop house so the pigs won't tear the plastic cover. 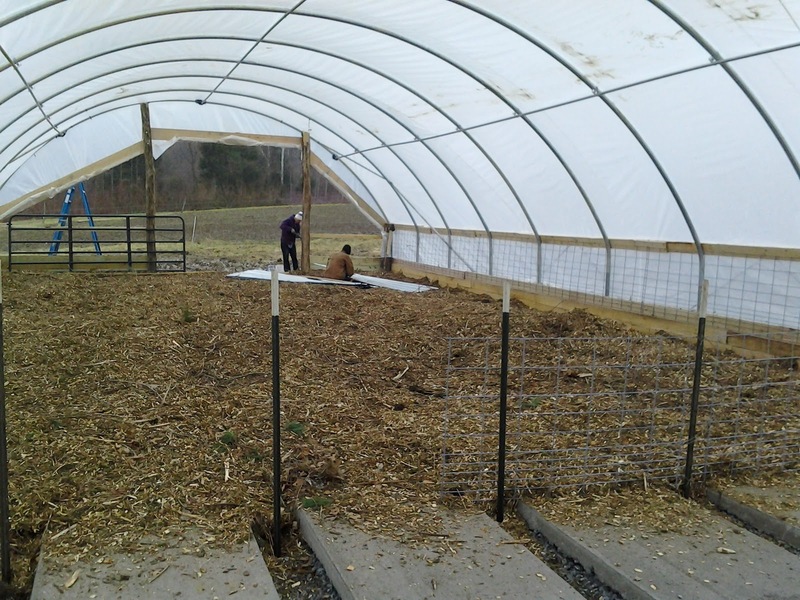 We were thankful to have extra help for this project which came from the many "check-outs" that worked on the farm for two day periods in early January. "Check-Outs" are the folks that applied for summer intern positions and that the Salatins invited to come out for a working interview. 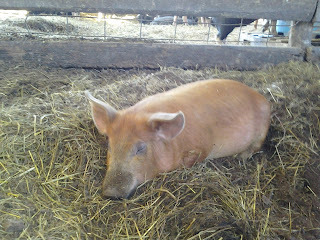 It was fun to meet so many great people who were interested in sustainable agriculture. I look forward to the crew we will have this summer. 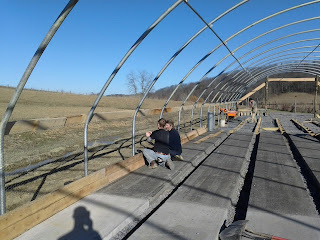 We're getting ready to pull the plastic tarp over the hoop structure. 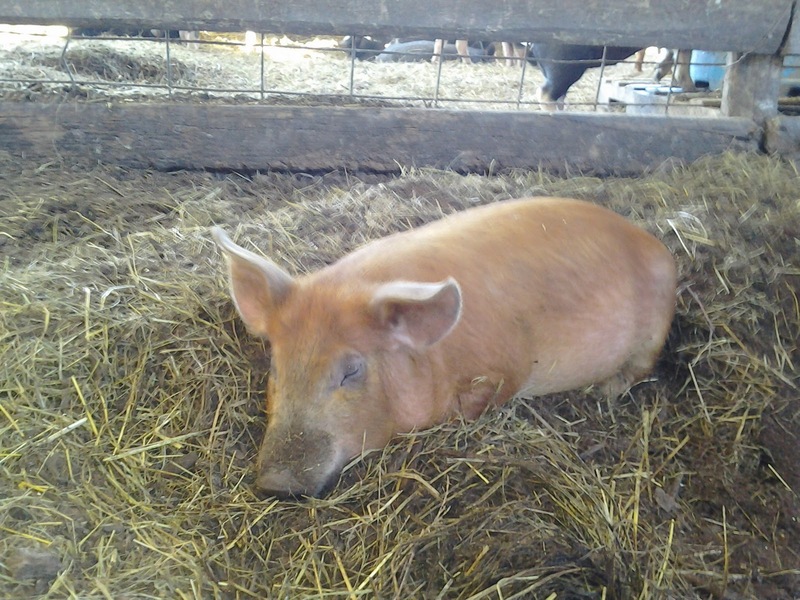 Here you see the deep bedding of wood chips the pigs will enjoy. Building the forms before the next section of cement is poured. The final product! We have four groups of pigs in the hoop house. Hi, My name is Eric Barth. I was born in Virginia, but lived 15 years with my family in Oak Brook, IL. before coming to Polyface in October 2010. The second born of 10 children, I was home-educated and always enjoyed outdoor physical work. 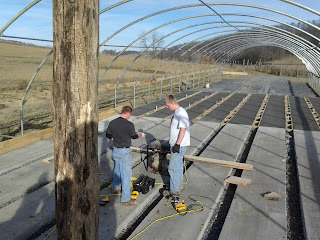 During high school, my brother and I started a landscape maintenance business and continued it for several seasons before I started my Polyface apprenticeship. I have always had an interest in agriculture because of my family's commitment to wellness and my father's agricultural heritage. As my knowledge about the decline in our nation's food system deepened, I had a growing desire to produce and offer wholesome food to those interested in an alternative to commercial farming. 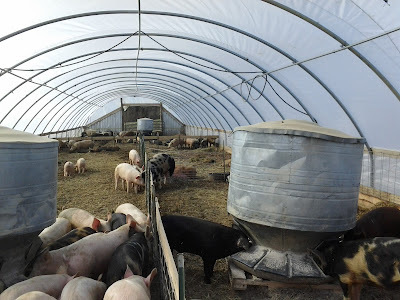 I am is excited to see how God will use this opportunity to prepare me to be a future "lunatic farmer" who can give customers the best food possible. After a one year apprenticeship, I am now full time staff and excited to be part of the Polyface mission. Christmas Fun and New Year begun!